Our Etsy giveaway this week is inspired by Jackson Pearce’s book Sweetly and is brought to you by the amazingly talented Jaz. My inspiration comes from vintage storybooks, dreams, movies, nursery rhymes, Alice in Wonderland, steampunk, sea creatures, mermaids, museums, art…the list goes on and on. Size: 12″ x 16″ (30.5cm x 40.6cm) – with a white border for ease of framing (A3 size in total). These prints are beautiful on their own or in a frame! There’s lots of little details painted into this one! Lots of different sweets on the house, along with melting ice-cream cone turrets, and a roof made of candy hearts. 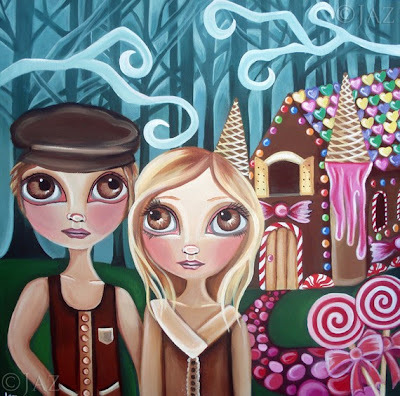 I’ve purposefully made the house nice and bright, so that it contrasts with Hansel and Gretel in their bland and worn shades of brown and cream. It’s a professional 12″ x 16″ art print on Glossy Photo Paper, printed with archival ink, so your art print should stay nice and bright for many years to come! To enter to win 12×16 fine art print simply leave a comment below. Add up your entries and leave the total with the links in your comment. Contest ends August 31, 2011 and is open internationally. What a cool picture.. Would love to win! Love this type of art. +2 follower and facebook like. +1 I have hearted her shop. I love your work! Its like the joyful sarcasm of Chris Mars’s pieces. You have a great talent. Hope to win your piece!